This summer, on the hottest and possibly most humid day of the year, I headed up to the Shenandoah Valley to photograph Elizabeth Locke's estate for Garden&Gun, one of my favorite magazines ever. Needless to say, it was divine and even her chickens were quite photogenic. 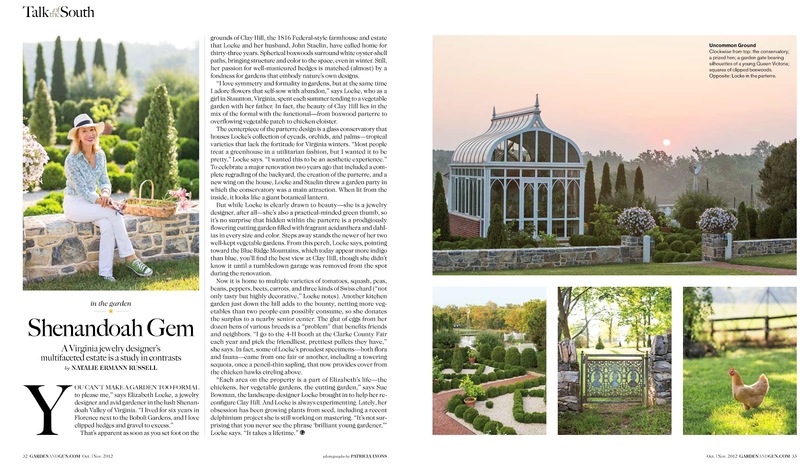 The house had been featured in Architectural Digest so my focus (ha) was on the gardens and the gardener extraordinaire. Elizabeth and her husband John had the gardens and home looking perfect (which I suspect they always do) and graciously extended an invitation to stay overnight in their guest cottage (yes, please!). We enjoyed dinner on the veranda, where I enjoyed hearing their stories and all about how Elizabeth started her jewelry business over delicious foods from her garden. Perfection. Photographers typically prefer to shoot exteriors and landscapes in the morning or evening light, so I try to schedule these so that we can shoot, sleep, then shoot again in the pretty morning light. Everything looks completely different when the sun is coming from the opposite side, so it's nice to be able to see the options and shoot things the way they look best. One of the greatest payoffs was coming up to the house at 5:45 am or so and catching the sun rise over the greenhouse. The pinks and yellows were so dramatic, I knew we had our shot! Elizabeth herself was a treat. A very cool lady, even in the torturous heat, who managed to look like a million bucks while my hair was pasted to the left side of my face and I continually wiped the um, humidity from the camera screen. I loved her green sneakers which matched her stunning peridot necklace! And being the perfect hostess, she sent me home with two large bags of delicious vegetables, and flowers from her cutting garden. Elizabeth, thank you for a lovely shoot and I do hope our paths cross again (in a cooler climate perhaps) soon!